Year-round, the Outdoors has plenty to offer you and your family and friends in terms of adventure, respite from the stresses of daily life, and the chance to drink in lungs full of clean air while getting exercise in natural surroundings. You don’t need to be an Olympian to enjoy the outdoors, either—your ideal adventure could be a gentle hike along a scenic trail, some mindful paddleboarding, or an evening spent stargazing and toasting marshmallows. Just check that the activity is safe for all members of your family, especially any little ones in the group. Quite literally an otherworldly experience, stargazing is a mindful pursuit for all ages and all members of your family. While you can spot stars in your garden, it helps to get out of the cities, where light pollution will be minimised. This alone makes stargazing the perfect excuse to head out into the countryside. While a telescope and star map are invaluable for serious spotters, smartphone apps such as SkyView are great fun to use. Simply fire up the app and point it at a portion of the night sky to identify different stars, constellations and planets. You could also use binoculars to get a close-up view of interesting stars and planets, and have fun trying to work out the different constellations yourself before consulting an app to see if you’ve guessed correctly. Depending on where you go to stargaze, you could also take a mini BBQ for toasting marshmallows or for rustling up al fresco hot dogs. Sustainable coastal and woodland foraging are growing in popularity, with many outdoors companies running foraging courses to help you identify what is and isn’t safe to eat in the countryside and along the coast. These courses also educate you on vulnerable plant species and habitats that aren’t to be foraged. While some foraging delights might be an acquired taste (Dandelion tea, anyone? ), others such as wild garlic, blackberries and Pineapple Weed are tasty. Chanterelles (wild mushrooms) are delicious too, but you need to be careful when foraging wild mushrooms, so signing up to a guided course is a good idea for beginner’s. These foraging courses vary according to the season. Charities such as the National Trust run sustainable woodland and coastal foraging experiences at various locations throughout the year. Hiking is a brilliant introduction to adventuring in the great outdoors. If you have kids in tow, adding in some extra interest during gentle group hikes can help keep the little ones entertained. Luckily, the options are endless, from fossil-hunting expeditions along Dorset's Jurassic coast, to ramblings around neolithic monuments (explore the Coldrum Long Barrow in Kent) and accessible mountain peaks like Helvellyn and Snowdon (try the Pyg Track to the summit). There’s plenty of hiking kit around to see you right for a day (or longer) on the trail, with the basics including hiking boots or proper walking shoes, plus a rucksack for holding water and snacks, and any items you might need for the kids if they aren’t able to carry them. Whilst this isn’t suitable for the younger members of your family, sport climbing can be fun for the rest of you, depending on your level of mobility, and offers a wealth of health benefits. It might have the word ‘climbing’ in it, but sport climbing is arguably as risk-free as you can get on the outdoor climbing spectrum. In short, you clip your rope into an existing series of bolts, reducing the amount of equipment needed. Although popular on the continent, ‘bolting’ climbs are not a given in the UK, so you’ll need to visit a specifically bolted area. Don’t worry, there are plenty dotted around the UK. Starter ‘grades’ are around f5A, with plenty of overhead up to 9A+ (world class), and equipment is widely available for hire. You’ll need indoor climbing gear to get started, plus a rope, helmet, quickdraws, and a guide for the location you’re climbing in. Popular spots for sport climbing include Wyndcliffe Quarry in the Wye Valley, and Dancing Ledge at Swanage. Camping is the central pillar of outdoors life and a way to acquire important practical skills that can be used in a range of situations. It’s also the perfect activity for escaping the hustle and bustle, and for hanging out with family and friends. Most people go camping in late spring through to autumn, but with the right cold weather camping kit you could extend that. The basics of camping gear includes a tent, sleeping bag and a headtorch or camping lantern to light your way at night. Beyond that, you could invest in a range of camping gadgets and accessories. If you’re car camping, there’s no end to what you can buy to create a home-from-home vibe in the outdoors. For those of you camping with little ones, read our expert advice on Camping with kids, designed to help them enjoy sleeping in the outdoors and to feel safer at night. Looking to get off the beaten path? Then perhaps try wild camping. A little planning ahead means you can easily escape the crowds without trekking for days to remote spots; Dartmoor, for example, is known for wild camping. Just do your research beforehand to ensure the place you’re scoping isn’t off-limits to the public. Another one for you and the older children and teens in your family who are confident swimmers. Coasteering involves donning a wetsuit, helmet and a lifejacket, then scrambling, bouldering, swimming and leaping your way along a section of the coast or river. Regular jumps into plunge pools are par for the course. 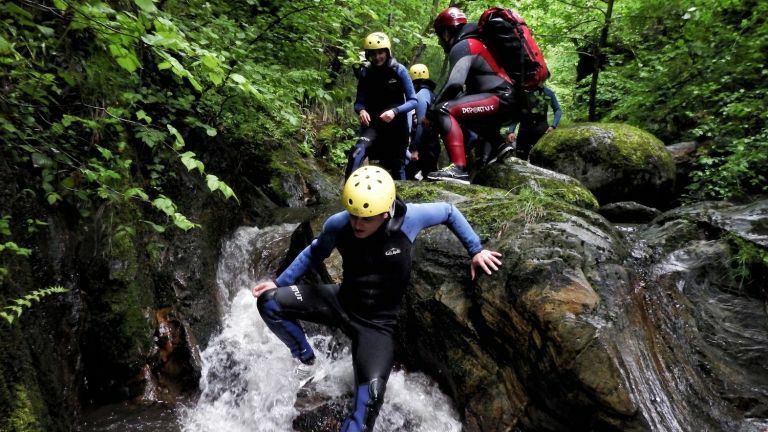 The only thing that limits your ability to get involved with coasteering is needing a suitable section of coast, although river gorges can sometimes be pressed into service. Buy a cold weather wetsuit and you can enjoy coasteering throughout the year. Newquay in Cornwall has plenty of spots to check out, or there’s the more adventurous Greve De Lecq in Jersey. Head to the National Coasteering Charter to learn more about safe coasteering, recommended age groups, essential equipment, and where to go. If you’ve never tried stand up paddleboarding (also known as SUP), you’re in for a real treat. In a nutshell, it involves you standing up on a paddle board (attached to your ankle via a leash) and moving a paddle through water to gentle power yourself along. Once you’ve got the hang of standing up, the watery world is your oyster. From exploring astonishing coastlines to slow-cruising inner-city canals, SUP can take you anywhere and everywhere. With practice, longer trips (known as tours) are totally doable. Just grab your SUP board, a drybag of spare clothes and snacks and go. For scenic stand up paddleboarding, check out Poole Harbour in Dorset, Knoydart in Scotland, and the River Avon in Somerset.